Equipped with the latest weaponry, and carrying more than 200 sailors, the orbiting warship USS Michaelson is armored against the hazards of space and the threats posed in the vast nothing between planets. But who will protect her from the threats within? Ensign Paul Sinclair is assigned to the Michaelson as the ship's lone legal officer, a designation that carries grave consequences when the ship's captain, Pete Wakeman, is ordered to return to port for court-martial. His crime: ordering the destruction of a civilian research vessel. What happens when a man of power breaks a law that reaches across the universe? The answer is for Sinclair to expose or to conceal, actions that could destroy the futures of both men. 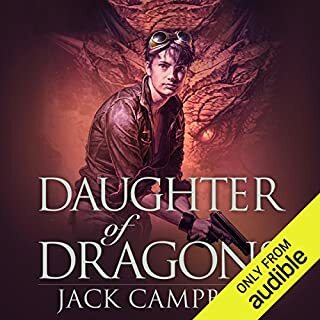 BONUS AUDIO: Includes an exclusive introduction written and read by author Jack Campbell. 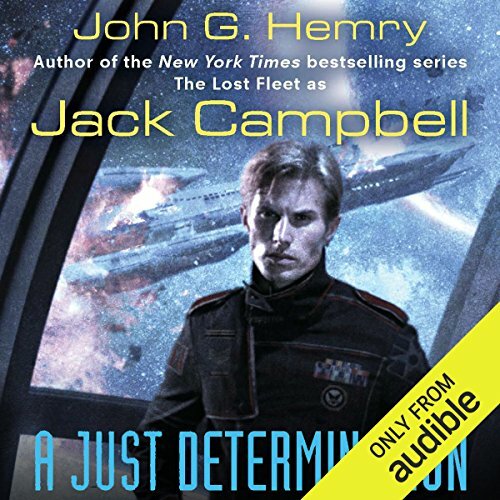 A Just Determination was originally published as "by John G. Hemry". ©2003 Ace (P)2009 Audible, Inc. I should say up front, I'm a fan of John Hemry's novels, especially the Lost Fleet Series. I liked this one as well. This is the story of a young military officer (the fact that the setting is in space is totally irrelevant to the story) who ponders the meaning of leadership when his commanding officer errs in the use of deadly force. It's sort of a "Caine Mutiny" in space, but without the mutiny. The story also reminds me of the sad tale of the USS Vincennes, whose crew shot down an Iranian airliner full of civilians. I have a couple of minor criticisms. First, the wholesale application of US Naval tradition to a future space force is somewhat disconcerting as it gives the novel a bit of a split personality. I think Hemry must have realized this because he did a much better job of imagining a space tradition in the Lost Fleet Series. Second, because the story is told from the perspective of a junior officer (and perhaps for dramatic reasons), the portrayal of the commanding officer is annoyingly two-dimensional. In my experience, the situations surrounding the tough decisions soldiers make when lives swing in the balance are never black and white. Likewise, leaders are neither good nor evil, just human beings who, when thrown into the breach, are equally likely to do good or evil. Bottom line: a leader's reality is much more equivocal and ambiguous than Hemry makes it sound in this story. That said, there are no heroes here, no happy endings, and that makes the novel readable. First off, I was a little hesitant to listen to this book because of the bad reviews but I took the plunge and it was worth it. Jack Campbell has served in the Navy and knows that navy life isn't very exciting. Campbell describes the day to day life a young ensign straight out of the Navy Academy. Campbell has also obviously read the UCMJ (Uniform Code of Military Justice) and the JAGMAN (Judge Advocate General's Manual) and the Manual for Courts-Martial because he depicts a very realistic court room environment. The only bad thing I have to say about this book is that A Just Determination is a lot like the Caine Mutiny just in space, however I enjoyed this a lot more than the Caine Mutiny. The only unrealistic thing is that one officer in the course of his three year tour of duty on board his ship would be involved in four separate court martials, but that's the only way to make it into a series and the whole series is amazing. A must read for military, sci-fi, and lawyer fans. Listening to this novel was actually surprising. You expect something significant to happen ... but then it doesn't. The entire storyline is based around the tension that the main protagonist feels in undertaking what they believe they should do versus doing what others think they should. However, there is next to no real pressure to follow the others so that the tension seems all imaginary. The testimony which is provided contains nothing that would not be apparent in a reading of the 'orders' in question so the need for such testimony and tension seems questionable [not being a lawyer and not having personal experience in court I can't say for certain that this is redundant in courts but seems silly and makes the plot weak] As for the court room drama I found that there was probably too much time spent in the mundane actions in the court. The characters in the story are reasonable. The actual court scene and arguments have nothing to do with science fiction other than the events they deal with occurred in space. The initial part of the novel is interesting but finishes all top soon into a prolonged court drama. A Just Determination almost reads like an episode of Law & Order set in space. You have a short intro to the characters and the ship, the ship sets off on its mission and quickly encounters a crisis resulting in deaths and potential crimes, which ultimately leads to a military court procedural. I was interested in this book because I have a close friend who is Army JAG and one of the most interesting aspects of her stories from both the defense and the prosecution side of the job has been the huge difference between military law and criminal/civil law. I wanted to see if Campbell showed that in his story set in space and to some extent he did. However, this story really is more about aspects of leadership and personal ethics which made it a "broader" story in some ways. I enjoyed listening to the book and I thought the moral dilemma of the main character was well presented - made me think. I also really liked the fact that Campbell portrayed a Space Navy that was fully integrated with many ethnic names and both men and women in positions of leadership. He also did a nice job of balancing his protagonists and antagonists across genders and gave all of his characters some believable flaws - no unrealistic superhero types here. However, from a "literary" standpoint, the book was a bit disappointing. There is quite a lot of dialog and it was rather wooden and unnatural sounding and I didn't really connect with any of the characters because they aren't that fleshed out. And, while I enjoyed the story, the plot is not very complex and the moments of suspense and real action are very limited. Nick Sullivan does a competent job with the narration. I think he was a bit limited because the dialog in the book is kind of stiff. But I really like the way Sullivan conveyed the difference between the characters thoughts and his spoken words. Although A Just Determination is set in space, there is only a little "sci-fi flavor" to the book and not a lot of action so it may not satisfy some sci-fi lovers. However, if you have an interest in law, particular military law, you will probably find this book entertaining. I enjoyed Jack Campbell's introduction to this new series, he tells how he came to write it. Nick Sullivan did an excellent job in narrating the story. This is not a story of battles but of the operation of a naval ship (this could have taken place aboard any naval vessel upon the sea as well as in space). Just out of the Naval Academy Ensign Paul Sinclair is assigned to the USS Michaelson and is assigned a secondary job as Legal Officer. Much of the book is about his duties as legal officer and the leadership abilities and personalities of the officers on non-Com's. For those who like military stories this is an excellent story and a good lead off for the upcoming series. I hope he can build as much drama in this series as he did with the Lost Fleet Series. Can not wait for to start book 2. This is NOT Blackjack Geery! 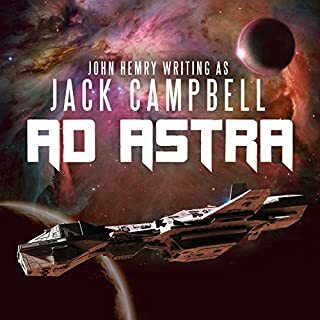 An introduction by John G. Hemry (the author's real name) tells us that the series's title (JAG is Space) is a pure rip-off of the TV series. In fact the central character is not JAG at all, but a brand new ensign joining his first billet, on a medium-sized "US Navy spaceship". Ensigns always get a primary mission and several secondary missions. Paul Sinclair gets stuck with "Legal Officer". Campbell/Hemry could just as easily have situated this book in today's Navy. The congruence is about 99%. The ship is nothing particular, with good officers and lesser ones. The captain is a careerist, but no more so than many in the armed services. Then "stuff happens", and Ensign Sinclair must make some tough choices. This is a book about the military... in which there is almost no action. It is not about war, it is about sailors and about one man's apprenticeship of duty. 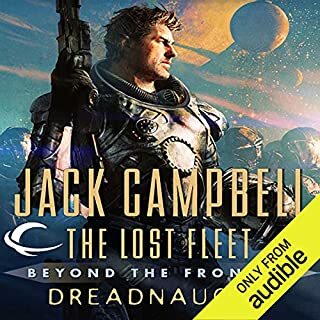 As a fan of the Lost Fleet series, I was happy to get the Audible version of this book from a recent sale. As expected from the author, we have a story of a personable and decent guy in a military world where people are people - good and bad. 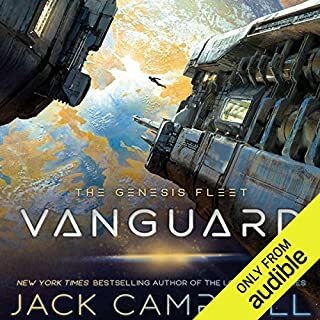 Most of the book is the main character acclimating to life on his new ship; it is near the end that an event happens and we go through a realistic type of military trial. Our protagonist isn't a lawyer and doesn't want to be one (he had a rudimentary legal course prior to assignment on the ship), but he has a strong personal sense of justice and that precipitates his participation in the trial. Story: Paul Sinclair is an ensign newly assigned on the USS Michaelson. As he gets to know the crew - featuring a huge variety of characters from incompetent captain to high strung shipmates, he forms friendships, learns lessons, makes mistakes, and ultimately finds his place about the ship. But one event will change all that when the Michaelson is on patrol and encounters a foreign ship's incursion into their sovereign space. Misunderstandings mount, the foreign ship is destroyed, and a captain is put on court martial trial. Will Paul allow his active dislike of the captain to watch the man hang on trumped up charges - or will he defend someone no one else believes in? Hemry/Campbell's ability to write likeable everyman characters and to populate his world with nuanced, flawed, but very believable people is clearly the strong part of the book. You'll like or hate Paul's crewman but none ever feel like cardboard cut outs. There are no evil villains or saints - some may be selfish, greedy, stupid, short sighted, or intensely loyal to the point of fault (sometimes all at once) but none ever feel like they are there simply to make the main character have something to do. The trial goes for realism over drama so there is quite a bit of procedural stuff to get through. Since it is the last 1/4 of the book, it's not too problematic. The trial will, of course, hinge on the testimony of our main character. And will cause higher ups to notice and respect him - which may be unrealistic in itself. But this works as a dramatic fiction so I didn't mind it. Once I had finished, I immediately purchased the next book. I found I wanted to read much more about this world (set perhaps a few centuries before the Lost Fleet - when there was still a United States). It is an easy read/listen and the narrator did an excellent job giving all the characters a unique voice. I am a huge fan of of John G. Hemry a.k.a. 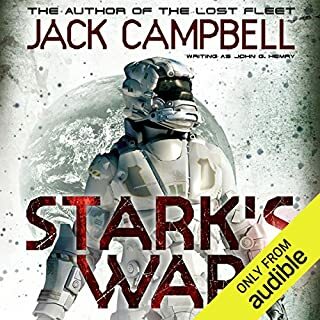 Jack Campbell.Despite this, for quite a while I avoided this series because I like military sci fi, not courtroom dramas. I thought this would be a courtroom drama set in space. However, I tried the series based upon Hemry's great skill as a writer. I was pleasantly surprised to learn that these books are really the story of a young officer in space who acts as the legal officer as a side duty. There is military justice involved but that is only a portion of the stories. So far, there has not been a lot of combat -- but there is a lot of military in space with Hemry's very strong knowledge of shipboard operations. 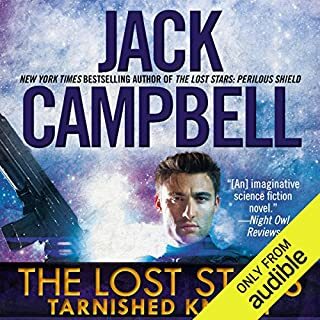 If you are a fan of Jack Campbell, give these books a try. Moving from straight space warfare (Stark's War, Lost Fleet, etc.) Hemry/Campbell now uses space military as a vehicle to explore the military courtroom. JAG in Space is yet another fabulous series that develops over several books. Unlike the other series where I have tried to do reviews on the series as a while only (with the first book in each) because each story here is truly an independent one, I plan to try to do reviews on each. As a series, JAG in Space is not your typical legal thriller. In typical Hemry/Campbell fashion it explores unusual scenarios, but this is not from the perspective of a lawyer. The main character here is a legal officer, a cadet with a two week course designed to assist him in doing little more than providing advice to superior officers. Paul Sinclair has no desire to become a lawyer, but he knows where to turn. Eventually he befriends the top JAG lawyer. Unfortunately, her own duties can put her in an adverse position. This is another great series from Hemry/Campbell that should not be missed. Its one failing is that the story line deserves more books and I hope Hemry will fix that one shortcoming. This first book explores the captain's acting through ego and looking to justify his actions when clearly violating the law. He then tries to shift the blame to his crew, including the legal officer caught between trying to be faithful to his line of command and trying to fulfill his responsibilities. While certainly the weakest of the series, it is hardly weak. That the remaining books are that much stronger is no reason not to give this book the five-star review it deserves. Do not look for mystery and violence to support this story, but that does not mean that it is short on tension and suspense. The characters need to deal with competing moral imperatives while developing their own relationships, and trying to avoid finding themselves in trouble with strict military rukes and commanders. If you can recognize and appreciate it for what it is, it is an exciting and entertaining story. It us still a thriller in its own right. But then you should know that -- it is, after all, John Hemry. not as action packed as other books by the same author. the courtroom drama however was quite good.